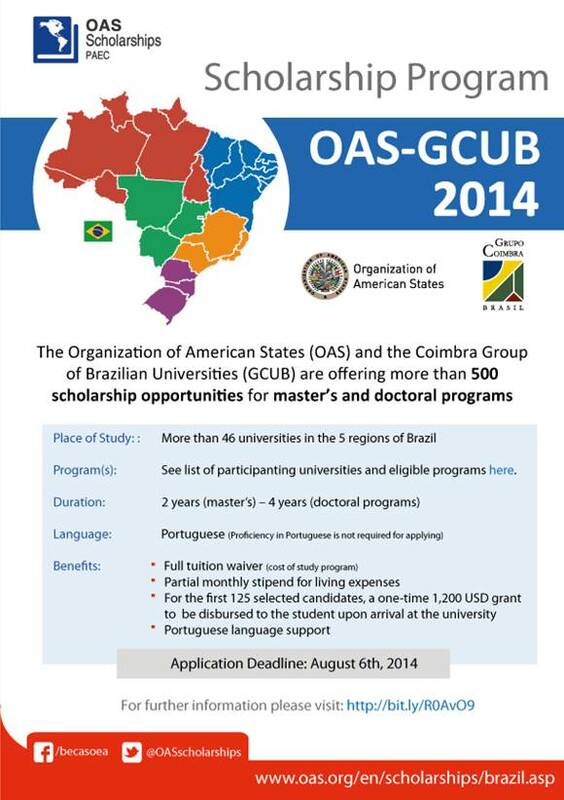 The Department of Human Development, Education and Employment of the Executive Secretariat for Integral Development Organization of American States (OAS), advises that the 2014 OAS-GCUB Scholarship Programme, providing educational scholarship opportunities for students in Grenada, is open for applications. The programme provides more than 500 scholarship opportunities to outstanding citizens of OAS member states to pursue Master’s or Doctoral programmes in Brazilian universities. A one-time grant of $1,200 USD to be disbursed once the student arrives at the university, to the first 125 selected candidates. Portuguese language support. There is no Portuguese language requirement at the application stage. The benefits are available for up to 24 months for Master’s and 48 months for Doctoral degrees. Deadline to apply is 6 August, 2014.